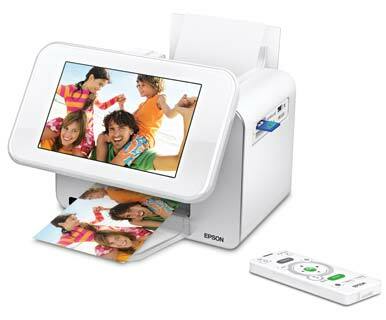 The PictureMate Show PM 300 is a snapshot printer and more: Epson has integrated a digital frame into its design. Getting two products in one makes the PictureMate Show's relatively high price more palatable. You can also print, of course, and the PictureMate Show does a great job of that. In our tests, it printed color photos as fast as 1.4 pages per minute (ppm), with natural fleshtones, vivid landscapes, and attractive objects; black-and-white photos showed smooth grayscales. Its less-expensive cousin, the PictureMate Charm PM225 ( ), is slower but produces equally outstanding photos. An infrared remote that comes with a CR2025 lithium button battery controls the printer and frame; menus appear on the LCD. The remote worked well from many angles but not from the cradle where it rests on top of the printer; Epson claims that it has a range of 16 feet, though we didn't test this. If you lose the remote, you can buy a replacement from Epson for $30. The PictureMate Show is designed to work independently of any computer. But in standalone mode, it has a few quirks. The cropping tool requires a lot of tedious zooming and shifting. For layouts smaller than 4 by 6 inches, you can't choose photos at random; instead, you have to print a single photo, all photos taken within a certain date or month, or all photos on the media. Although there is a Mac driver that needs to be installed, the software does not come with much. After choosing the printer in System Preferences, Epson does not provide any photo editing or viewing software, so you must print photos through applications like iPhoto, Preview, or Adobe Photoshop Elements with a USB connection (cable not included). Standard printer features include a rear 20-sheet input tray and front output tray. Two slots take CompactFlash, Memory Stick, SD Card, and XD-Picture Card media; there's a USB/PictBridge port, too, and Epson sells a Bluetooth adapter for $39. The unit comes with a carrying handle, but the PictureMate Show is not truly portable—it lacks a battery option. The single ink cartridge is a wide bar that slides in and out of a rear bay. Epson includes a starter-size, 20-print cartridge and 20 sheets of paper with the printer. A replacement pack containing a 150-print cartridge and 150 sheets of paper costs $38, which works out to about 25 cents per print—very economical compared to other snapshot printers we've tested. Unfortunately, the PictureMate Show can't print photo-paper sizes other than 4 by 6 inches. HP sells some snapshot printers, such as the HP Photosmart A646 ( ), that can print on 5-by-7-inch and 4-by-12-inch photo paper, as well as on 4-by-6-inch sheets. Epson also states that their ink and paper provide long-lasting, durable photos that are water resistant, scratch and smudge proof, and can last up to 96 years under glass before fading. The PictureMate Show PM 300 is a standout in its category, offering great performance and innovation. An integrated digital frame transforms this snapshot printer into a full-time home accessory.